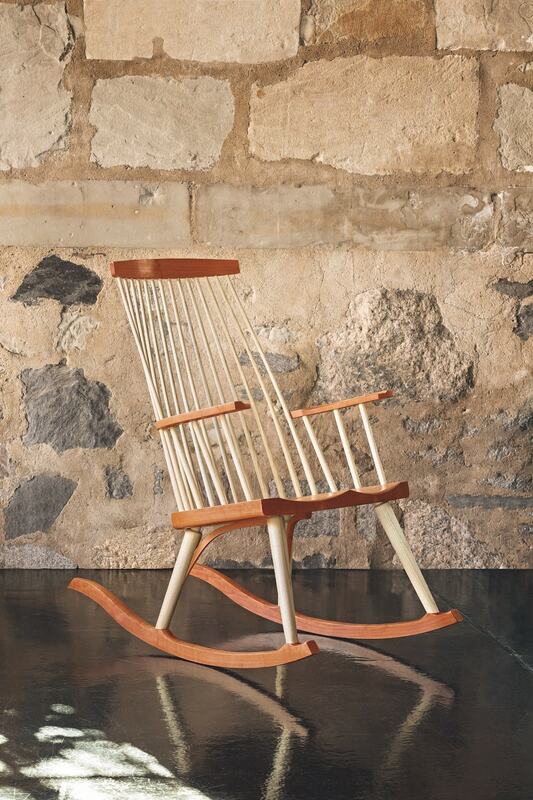 One of our long-time customer favorites, the New Gloucester Rocker is a Tom Moser design that first came to market in 1984, and is named for the rural Maine town that was home to our first workshop. Inspired by the aesthetic appeal of the Salem rocker that originated in New England circa 1840, Tom started with an adapted form of the deep, comfortable rocker seat, added his own spindle and arm design to create his first prototype, and kept refining from there. 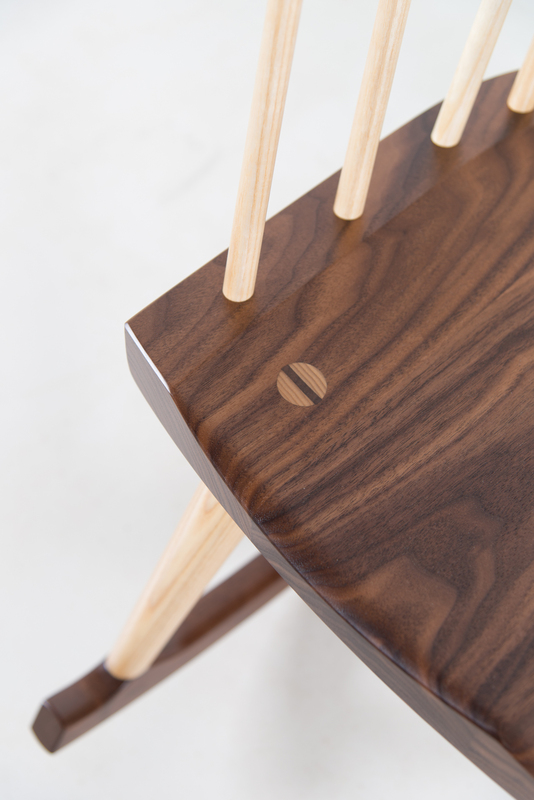 The result is a thoughtful integration of ash and cherry or walnut with simple lines, and a meticulous use of traditional mortise-and-tenon joinery. New Gloucester was home to our first shop, not far from the last remaining Shaker Community at Sabbathday Lake in Maine. This homage to the spare, graceful design found there will bring a place of serenity to your home. 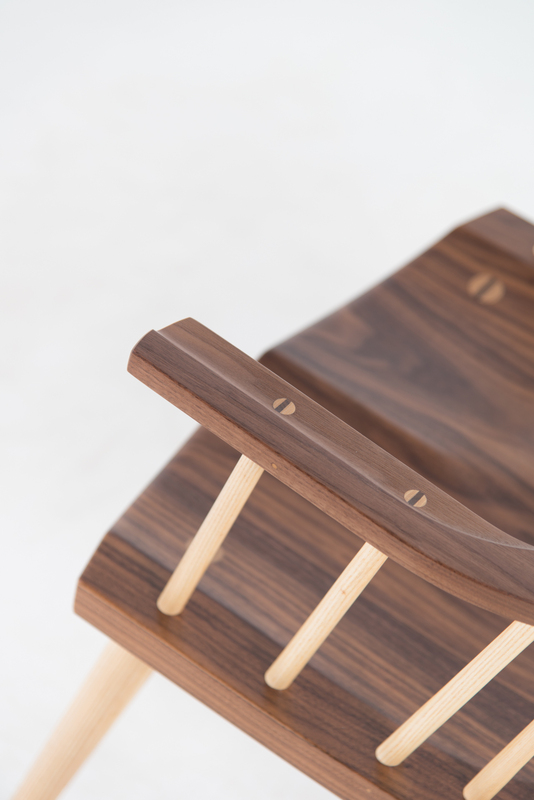 Ideally spaced to envelope the back in comfort, the ash spindles are joined to the back crest and sculpted cherry seat with wedged tenons, fitted at precise angles to allow both adequate flex and deceptive strength. 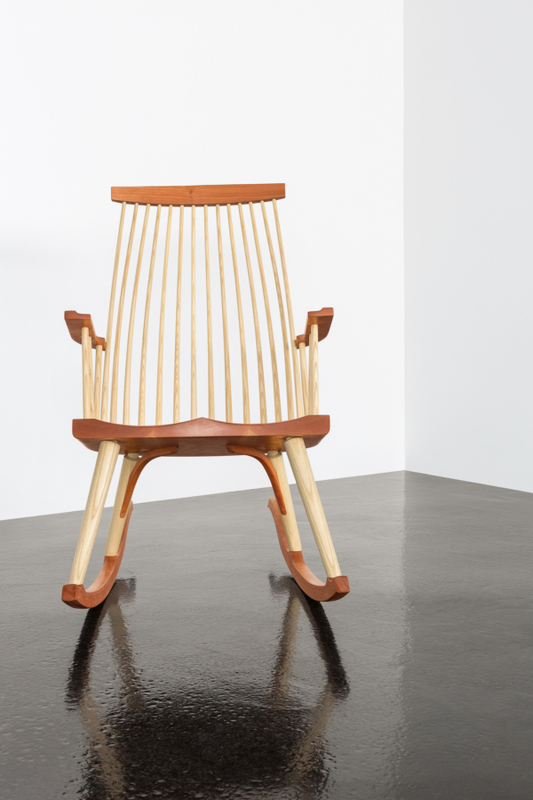 Viewed from any angle, the elegant lines of the New Gloucester Rocker are a marvel. The rockers are gently sculpted to form sweeping curves; the seat is carved from North American hardwoods and contoured for comfort; and both arms and back crest show the versatility and visual appeal of wood’s natural grain. 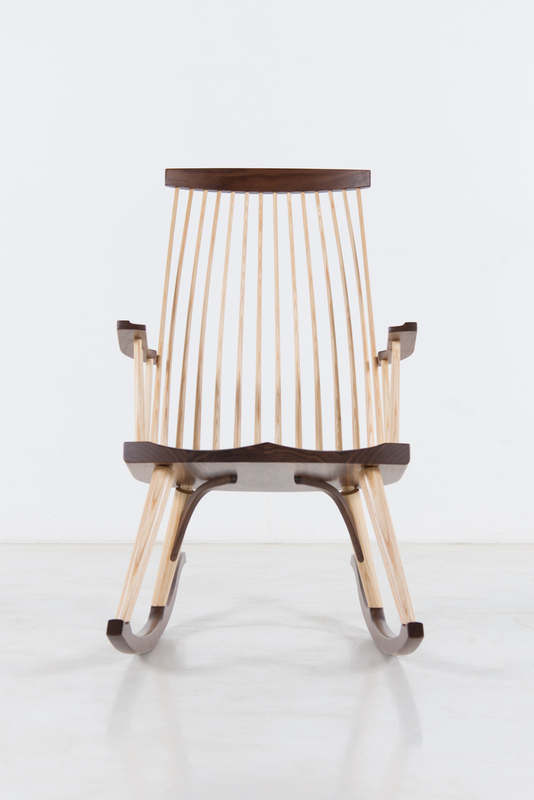 Vertical components of the rocker are made of ash – a durable wood that is immovable in larger cuts – as in the turned legs – and firmly flexible when slimmed to form the tensioned spindles that support the arms and crest. The spindles are tensioned as they enter both the crest and rails, helping to secure its form and allow a measure of “give”. 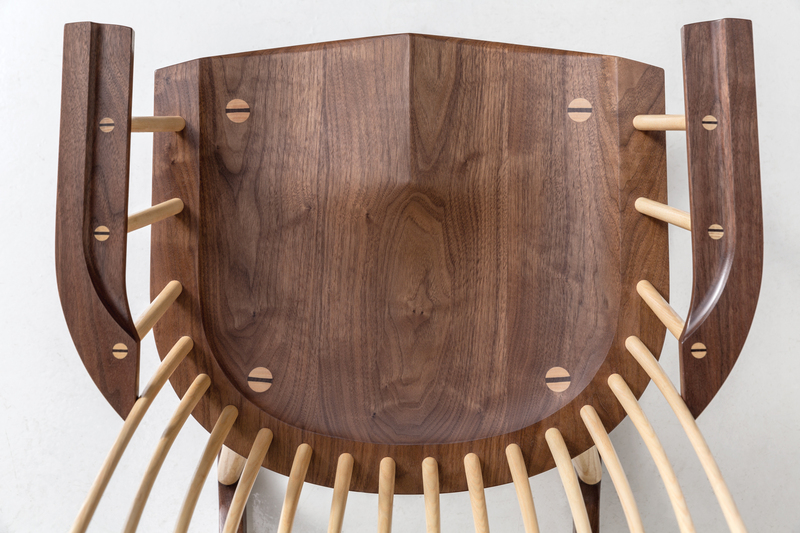 Once you are seated, the surprising comfort of its sculpted seat and flexing spindles is guaranteed to bring a smile. 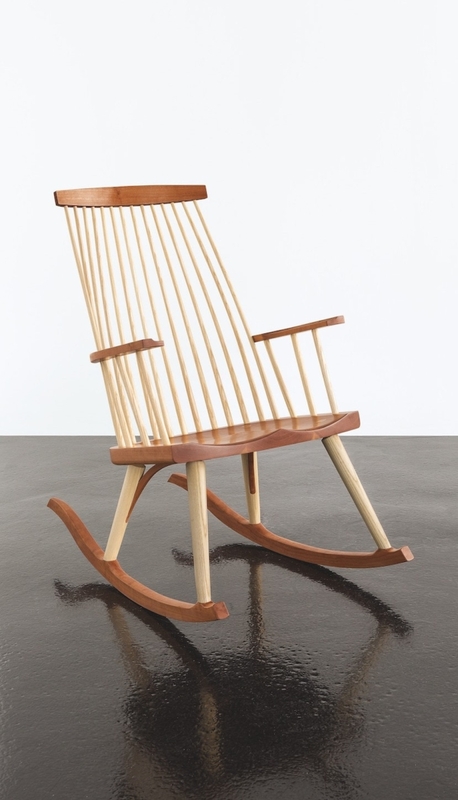 The New Gloucester Rocker is the perfect example of our commitment to creating heirloom-quality furniture. 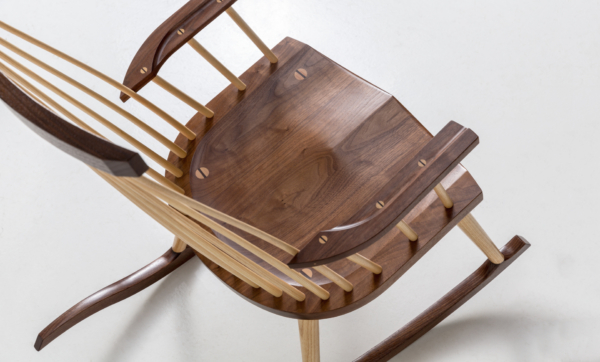 Its joinery and engineering are carefully executed to ensure generations of use. This is a rocker that will live with a family for lifetimes.